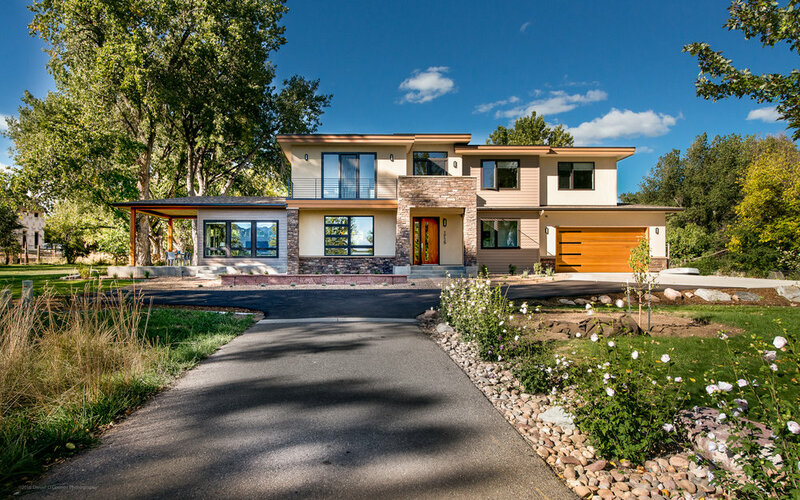 We helped the clients find a beautiful lot in North Boulder, then crafted this modern 3,300 s.f. house to be their dream home. The clients asked for a warm modern style home, with an open floor plan that connected to the outdoors and took full advantage of the rare lot. We sited and engineered the house for optimal passive solar design, while simultaneously capturing unobstructed panoramic views of the Flatirons from both levels. The home’s simple, clean lines reflect their unpretentious, easy-going character. The gourmet kitchen, dining and Great room are flooded with sunshine from the 9ft high ceilings and walls of glass. A gracious covered west porch flows seamlessly out from the Great room through a giant bank of sliding doors, creating a fantastic opportunity for indoor/outdoor living. The porch has solid cedar columns and Beetle-kill wood on the ceiling to create a warm feeling. On the ground floor, walk past the front hall to reach a guest suite and a rec room that is divided between a small media room for the boys and a north facing painting studio. Follow the stair to the second floor where you’ll immediately be presented with a stunning view from the open study and balcony. All the bedrooms get a south facing Flatiron view and the master has its own private balcony. The owners wanted the HERS 37 house to be as green as possible, and the house has tiny energy and water bills as well as a healthy indoor air environment. 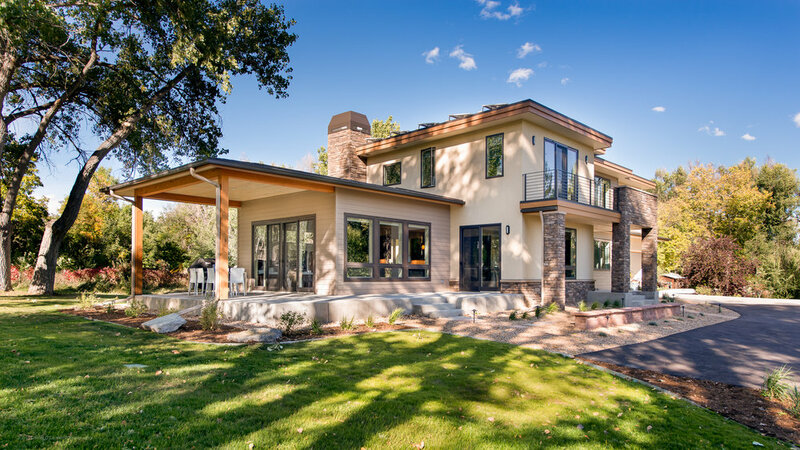 It features solar photovoltaic panels, Energy Star fiberglass windows, foam insulation, LED lights, Watersense plumbing fixtures, a 96% efficient furnace & zero-VOC finishes.